ABDUL ABASI AND GREG ROSBOROUGH ARE AMERICAN DESIGNERS BASED IN NEW YORK, AND THE MINDS BEHIND THE MENSWEAR LABEL ABASI ROSBOROUGH. THE TWO MET WHILE STUDYING AT THE FASHION INSTITUTE OF TECHNOLOGY IN 2008, AND AFTER WORKING FOR OTHER DESIGNERS FOR SEVERAL YEARS, BEGAN THEIR WORK TOGETHER IN 2013. WHILE THE DESIGNERS USE THEIR RESPECTIVE MILITARY AND ATHLETIC EXPERIENCES AS CONCEPTUAL MUSES, THEY ALSO FIND INSPIRATION IN DESIGN, ART, AND ARCHITECTURE. THEIR SPRING SUMMER 2016 COLLECTION, ENTITLED MONOLITH, RESULTED FROM ROSBOROUGH’S 2015 TRIP TO THE ARAB GULF. WHILE THERE, HE HAD THE OPPORTUNITY TO TAKE A JOURNEY INTO THE QATARI DESERT TO EXPERIENCE THE RICHARD SERRA INSTALLATION, EAST-WEST / WEST-EAST. THE INSTALLATION, A SERIES OF FOUR TOWERING METAL PLATES ALIGNED LONGITUDINALLY, STRUCK AN EMOTIONAL NOTE WITH THE DESIGNER THROUGH ITS MONUMENTAL PRESENCE AMID THE GHOSTLY SPARENESS OF THE DESERT. THE WORK CONVEYS A FEELING THAT IS BOTH ANCIENT AND PRIMITIVE, BUT ALSO GEOMETRIC AND MODERN, LONELY BUT STRONG, AND DEEPLY ETERNAL. THESE THEMES, ALONG WITH COLOR AND TEXTURAL INSPIRATION INFORM MONOLITH, WHICH WAS MADE IN NEW YORK CITY, AND CARRIED IN SPECIALTY RETAIL STORES AROUND THE WORLD. FOLLOWING THE COMPLETION OF THE COLLECTION, THE DESIGNERS COMMISSIONED ARTIST CECILIA CARLSTEDT TO CREATE A SERIES OF ILLUSTRATIONS INSPIRED BY THE MONOLITH COLLECTION. THUS COMPLETING THE CIRCLE OF ART INSPIRING DESIGN INSPIRING ART. Abdul Abasi and Greg Rosborough are two affable young designers who take pride in their craftsmanship and design process. Talking to the New York-based design duo was enjoyable and illuminating. After having worked in large fashion corporations, they founded Abasi Rosborough in New York City in 2013. The two were looking for a more creative avenue to express their views on clothing, all while using the skills theyacquired at the Fashion Institute of Technology, where theymet as classmates. Abasi and Rosborough analyze cultural production and find inspiration in sartorial traditions to produce new fashions. Their practice crosses lines between fashion and art. This exhibition focuses on one of their recent collections that connected both disciplines. During a trip to Qatar, Greg Rosborough visited Richard Serra’s site-specific piece East-West/West-East. The experience greatly impacted him and inspired Abasi Rosborough’s spring-summer 2016 collection Monolith, which is the subject matter for this show. According to Webster’s New Twentieth Century Dictionary, a monolith (mon’ō.lith) n. is a “single large block or piece of stone, as in architecture or sculpture.” While Serra’s work is comprised of four monumental plates arranged according to the topography of the Brouq Nature Reserve in Qatar, the designers focused their collection on a singular large structure, rather than on multiplicity or a set geographic location. Greg Rosborough described how Richard Serra’s work transformed the landscape. In his perspective, the artwork removed it from a specific place and time. “It looks like you’re in outer space [... the plates] are standing along in the middle of the dessert and it’s very haunting...” Years prior, in 1998, Hal Foster described Richard Serra’s work as governed by three dynamics: “engagement with particular precedents; elaboration, through pertinent materials, of an intrinsic language; and encounter with specific sites.” I argue that Serra’s three dynamics as described by Foster can elucidate the fashion collection Monolith, as I will proceed to explain. Abasi Rosborough’s work is deeply inspired by sartorial history and art. The classic men's two-piece suit was devised in mid-19th century Europe. It is now a global staple of menswear and has suffered minimal modifications since its inception. Abasi and Rosborough grappled with the idea that a garment has existed for over a century and yet it can be very uncomfortable to wear. Greg Rosborough wondered, “How strange is it that we live in the 21st century and no designer has meaningfully designed a suit jacket that respects your body’s natural anatomy and range of motion?” So they proposed changes to the basic pattern of a suit jacket by adding a gusset in a knit fabric that allows more mobility for the wearer. That newly designed jacket is one of the staples of the brand. It is a garment that they manufacture since 2013. Drawing inspiration from artwork, the fashion collection Monolith then became inspiration for new illustrations and photography. A dialectic between disciplines where art feeds fashion and fashion feeds art. The brand’s campaigns are spearheaded by Abdul Abasi, who often also photographs the collections. For Monolith, there were two campaigns, Odyssey and Hours. In Odyssey, the designers collaborated with an artist from Stockholm called Cecilia Carlstedt who, according to the designers, created “granular, minimalist” illustrations of the garments. They describe her work for this campaign as “Giv[ing] you that space to dream.” The illustrations use bright bold colors contrasting with black vertical structures, her interpretation of the monolith. For the campaign titled Hours, Abasi’s photographs featured models in sleek clothing against a background of a large black geometric structure. He juxtaposed the roughness of concrete with the softness of fabric, referencing the texture and appearance of Serra’s metal plates in East-West/West-East. “It came full circle, starts from an art piece, to fashion to art piece,” said Abasi. Abasi and Rosborough were particularly inspired by the materiality of Serra’s piece. They experimented with fabrics and leathers to create textures and colors that referenced the palette of East-West/West-East, as well as the patina developed through the passing of time. For the Ascent jacket - a collarless jacket with an asymmetrical zip placket - the designers mixed materials. Made with undyed kangaroo leather and hand-dyed cone denim, it presents a stylized patchwork that mixed shades of beige with textures of cotton and leather. Their use of this specific type of leather is an ode to Serra’s work. “We used Kangaroo leather that is completely unfinished so when you touched or squeezed it, the fat in the skin would cause striation with a marbling effect,” said Abdul. “So the wearer interacting with the garment actually changes the surface of it. Similar to Serra, whose exhibition will look different in 20 years, and in 100 years. Because it is constantly being bombarded by the Earth’s elements.” Like the artist’s work, which is meant to transform over time, the designs for this collection are made with materials that will show signs of aging. Various fabrics used in the collection, such as the hand-dyed cotton in the Arc denim jacket, were intervened by the hands of the designers. They gave the material a distressed look, again referencing the effects of time and the elements. 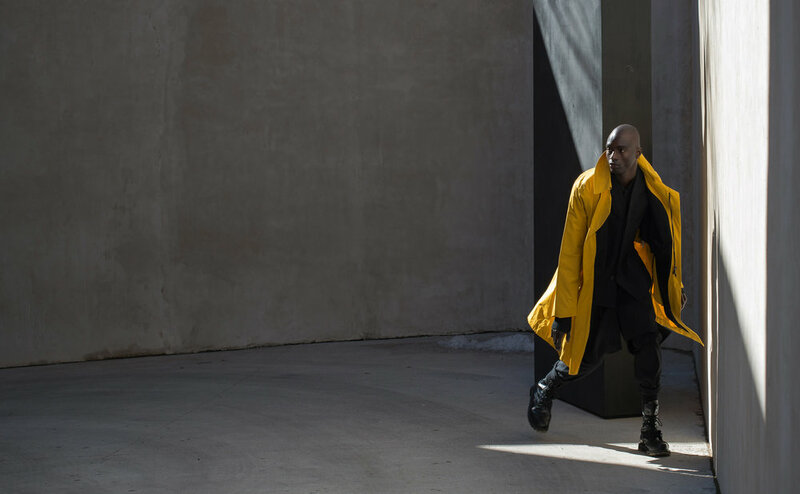 Abasi Rosborough’s Monolith collection draws upon Richard Serra’s recent site-specific work East-West/West-East, an instance where art and fashion intersect. This exhibition centers around creative processes and the ongoing dialogue between fashion and art. However, while Abasi Rosborough’s practice has poetic elements, the duo view design as a problem-solving discipline. It is here where they diverge from the paths of art. They create garments that they consider necessary, that respond to a need in the way people relate to clothes (ie. mobility) or the materials used to make them (ie. deadstock fabrics ). “Everything we do involves process,” stated Abasi. “We use art but we use the anthropology of mankind starting from [...] the first garments, what function they had and try to apply them to a modern context.” Design, then, is dislocated from a set space and time, with a vocation - inserted in modernity - of advancing the practice of fashion.